Nintendo’s Art Academy games on the DS and 3DS make clever use of the stylus and touch screen to teach art and painting basics to budding artists. They’re one of the best educational games I’ve ever played. And now they’ve got another one out with kids and the young at heart in mind, especially ones who are Pokemon fans! In Pokemon Art Academy, you’ll learn drawing, coloring, and cartooning techniques as you doodle many different kinds of Pokemon from the popular game series. Pokemon Art Academy is definitely geared towards kids, as they start things off very basic, even more so than the other Art Academy games. You’ll start off tracing symmetrical faces of Pokemon, then faces at an angle, then full-bodied illustrations. Heck, you won’t even learn advanced techniques like shading until the Intermediate Courses. Many of the skills you’ll learn in the game are more akin to what you’d see in a real life cartooning art class, like using basic shapes as a reference. A long time ago, I took a real life cartooning class from a former Disney animator who helped create Chip N Dale, so I know a thing or two about how these things are done (his name was William “Tex” Henson if anyone was wondering). In the game, you can take regular lessons in Novice, Intermediate, and Advanced courses. Each time you draw a Pokemon from these lessons, you can take up to three side lessons using the same techniques you just learned. You can also use Free Draw mode to doodle any one of the Pokemon you’ve already drawn. In the last mode, Quick Sketch, they give you the tools in each step to draw certain Pokemon, so you can quickly bust out illustrations if you don’t have time for a full lesson (although the regular lessons are pretty swift, too). You can also view your saved Pokemon cards in an album and even share them with friends and on Miiverse. Kids who love Pokemon and enjoy drawing will get the most out of this game. Reading skill is needed for the text. The game is definitely educational as it teaches real life drawing and cartooning skills, and it can help boost confidence as you’ll be able to draw some pretty good looking Pokemon pictures after the lessons. 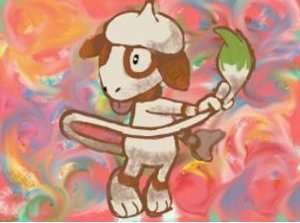 Pokemon Art Academy is rated E for Everyone. I’d also like to dedicate this review to my grandmother, who passed away about a year and a half ago. She loved to draw and paint, and even won local awards for her work. She even painted the backdrop mural for her church. Later on, she also taught art classes to kids. All of us grandkids got free lessons from her, though! I think she would’ve loved the Art Academy games, but maybe not on the small DS and 3DS screens. Nintendo is supposed to release an Art Academy game on the Wii U at some point. I would’ve loved to have shown my grandmother that one before she passed away, but hopefully she’ll be able to watch me play it in Heaven when it comes out. I don’t know if she’d be too terribly interested in the Pokemon Art Academy game, but if she was teaching a kid art lessons and he or she wanted to draw Pokemon, I’m sure she would’ve found some pictures of Pokemon to show them how to draw it!